Although sometimes maligned for its fat content, the creamy, heart-healthy avocado can play a very versatile-and nutritious-role in your diet. Here are a few facts about avocados. Avocados are a fruit, not a vegetable, and have more potassium than bananas. The Aztecs, among the earliest harvesters of the avocado, used it as a sexual stimulant. Avocados are cholesterol-free but have 30 grams of fat, most of which is heart-healthy monounsaturated fat. Hass avocados (the most common variety) are available year-round. They’re ripe when the skin is nearly black and the fruit yields to soft pressure. As if we needed another reason to love guacamole: A recent study found that compounds extracted from Hass avocados halted the growth of oral cancer cells by killing some and preventing precancerous cells from developing. The monounsaturated fat in avocados helps the body more readily absorb all the bioactive compounds they contain, which is why avocados are also linked to other types of cancer prevention. 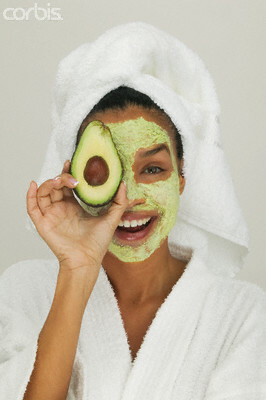 According to Shalini Vadhera, celebrity make-up artist and author of Passport to Beauty, the avocado should be smashed first, then the yogurt added. Once mixed, brush the mask on your face, and allow to chill for about twenty minutes. Why it works: Avocados have been known for their hydrating properties in moisturizers from some time, as cited in a 1995 study in Archives of Dermatological Research. There is also a limited amount of evidence suggesting that avocados may improve the skin’s defensive functions, as published in the International Journal of Cosmetic Science. Why yogurt works well comes down to the milk in the product, which contains lactic acid, an alpha hydroxy acid. Although the preferred alpha hydroxy acid is usually glycolic acid (because glycolic acid increases the thickness and firmness of the skin over time, while lactic acid does not), lactic acid is able to hydrate the skin extremely well. In fact, prescription LacHydrin, with ammonium lactate (a relative of lactic acid) is used to treat dry skin. Find amino acids in: Turkey, cheese, chicken, fish, beans, almonds, avocados, bananas, and pumpkinseeds. Combine first 6 ingredients in medium bowl. (Can be prepared 2 hours ahead. Cover and refrigerate.) Add avocado to salsa just before serving.